Need help with Lifestyle & Money Management Strategies? No matter how much you try to pretend otherwise, money is a critical component of your lifestyle. Specifically, your liquid assets and cash flow play a major role in determining the quality and long-term sustainability of your day-to-day approach to life. Without adequate money management, you run the risk of spending beyond your means and could find yourself forced to make unpleasant sacrifices. Sound money management involves spending less than you take in - and spending what you do earn wisely and efficiently. This requires budgetary discipline, typically backstopped by weekly or monthly budgets that account for all of your known expenses. It also involves smart saving strategies, including the creation and maintenance of emergency funds to handle large, unexpected expenses, such as a large medical bill that is only partly covered by your health insurance policy. Finally, money management involves determining how best to put your excess funds to work. Depending on your needs, this may involve saving for a child's college education, your own retirement or your heirs. Depending on your risk tolerance, it may involve a mix of equities, corporate and municipal bonds, mutual funds, annuities, life insurance and non-traditional investments for accredited investors. The Home: Does your home continue to meet your needs? Is it time to upside or downsize? Are better financing arrangements available? Is it appropriate to use one's home as leverage through a home equity loan or other product? Luxuries and Necessities: What constitutes a "luxury" item? What is a "basic" necessity? Can one live without coveted items, such as luxury cars, or make cost-effective compromises that do not dramatically affect quality of experience? Vacations and Second Homes: Is there a case to be made for owning a second home as an investment property? What is the best way to budget for big-ticket leisure activities, such as destination vacations? Asset Allocation: What is the optimal asset allocation that protects one's hard-earned wealth while requiring minimal changes to one's accustomed lifestyle? At base, Post Oak Capital Group strives to empower clients to make smart lifestyle decisions while maximizing quality of life. Lifestyle and money management is not just important during your working years. It is arguably even more critical during retirement. 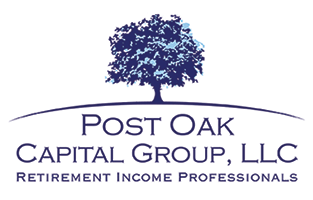 Each Post Oak Capital Group's Sugar Land retirement professional has the experience and insight necessary to assist you with managing your assets throughout your retirement, providing incisive advice about how to sustain - and even improve - your desired lifestyle. Done properly, preserving your hard-earned assets through your non-working years should not involve a radical reordering of your personal priorities. For more information about our lifestyle and money management services or to schedule a no-obligation financial review with an experienced Sugar Land area financial advisor, fill out the onsite contact page or call (713) 960-6949.